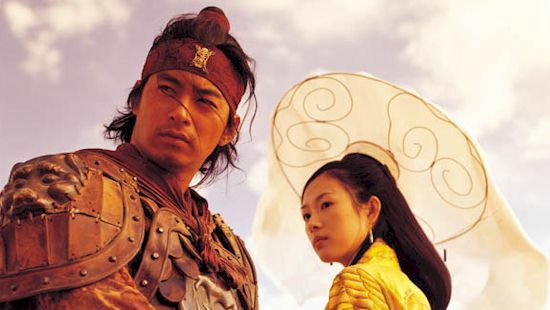 Joo Jin-Moo and Zhang Ziyi in Musa: The Warrior. The Skinny: Reminiscent of both Akira Kurosawa's Seven Samurai and Steven Spielberg's Saving Private Ryan, this costly Korean production delivers the goods in its epic tale of nine ill-fated Koryo warriors. And, Musa: The Warrior possesses one of the single best beheadings ever put on celluloid. Review by Calvin McMillin: Musa: The Warrior paints a vivid portrait of war's terrible beauty. One has only so long to admire the sweeping, panoramic landscapes of the film before they become bathed in the blood of its hapless characters. The setting is China, 1375. After ousting the Mongols, the Ming now face a rapidly deteriorating relationship with the Korean nation. When a diplomatic envoy from Korea arrives in China, the Ming troops arrest the innocent visitors as spies, exiling them to a remote desert. As fate would have it, the Koryo warriors escape their captors, but soon learn that freedom is not without its problems. Having failed in their mission, the Koreans find themselves at a crossroads. To return home to Korea as failures would be a shame none of them could bear, yet to stay in China would be a move that would effectively sign their own death warrants. However, fortune smiles upon the disaffected heroes in the form of a captured Ming princess, the stunningly attractive Buyong (Zhang Ziyi). The Koryo troops realize that freeing the lovely maiden from the Mongols would not only reconcile them in the eyes of the Ming, but it could be their only ticket home. So the small band of soldiers embark on a daring raid to save the haughty princess and return her safely to Nanjing. However, the Koryo warriors are being trailed by the Mongols, with their powerful leader (Yu Rong-Guang) at the helm. Arrows fly, swords clash, and heads roll as the Mongol forces do battle with the Koreans. The Koryo warriors final, fateful stand against the Mongols is the thrilling highlight of a sometimes beautiful, oftentimes brutal epic war film.